Which Republican presidential candidates are getting the most attention, favorable or otherwise, from the media these days? Actually, it depends a great deal on just which type of media you’re reading. The list looks quite different, however, if instead you’re reading about the nascent campaign in the blogosphere. Ms. Palin has a much more dominant presence there, receiving about 30 percent of the overall coverage on blogs — more than three times as much as any other candidate. 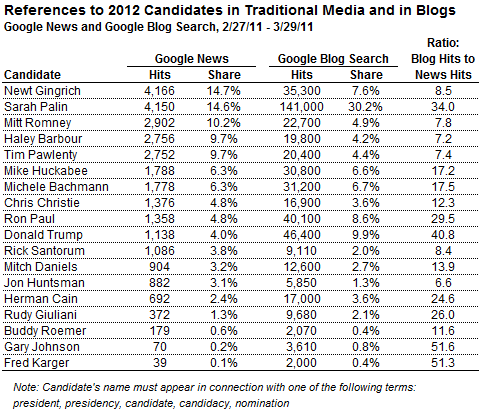 Mr. Gingrich also receives a fair amount of blogosphere attention, ranking fourth overall, but his share on blogs is smaller than in the traditional media. Meanwhile, rather than Mr. Romney, Mr. Barbour and Mr. Pawlenty, the top five in the blogosphere has Ms. Palin and Mr. Gingrich accompanied by three somewhat more controversial candidates: Donald Trump, Ron Paul and Michele Bachmann. These findings are drawn from a relatively simple search I conducted on hits in Google News and Google Blog Search, respectively, within the past month. I looked for all instances in which a candidate’s full name was mentioned alongside any of the following terms: president, presidency, candidate, candidacy, or nomination. I tracked this data for 18 Republicans who meet either of these criteria: they have declared their interest in the nomination, or they are given at least a 1 percent chance of winning it by the political futures market Intrade. Ms. Palin’s name, for instance, appeared in connection with her presidential aspirations in 4,150 articles in Google News, which mostly covers traditional news organizations with a print or broadcast arm. By contrast, the search found about 141,000 hits for her — about 34 times as many— — in blogs tracked by Google over the same period. There are far more blog posts than news articles online, of course, so the multiple by itself doesn’t tell us much. What is more interesting is how the multiple varies from candidate to candidate. The proportions are quite different for other candidates. While Mr. Barbour’s name turned up relevantly in 2,756 articles in Google News, for instance — not all that far behind Ms. Palin — it had appeared in only about 19,800 blog posts, barely more than Herman Cain (17,000), the talk-show host and Godfather’s Pizza chief executive who is running for the White House. The next question is whether there is any predictive power in this information at this early stage, when many other indicators, like polls, remain relatively unreliable. And if so, should a candidate prefer to be mentioned more often in the blogosphere or in the traditional media? Is one of these metrics a leading indicator and the other a lagging one? Intriguingly, although Hillary Clinton led in almost all polls of the Democratic nomination at this point four years ago, Barack Obama was receiving somewhat more media attention. Obviously, we would not want to generalize from a sample size of one — but this would suggest that press hits are worth looking at alongside other metrics. 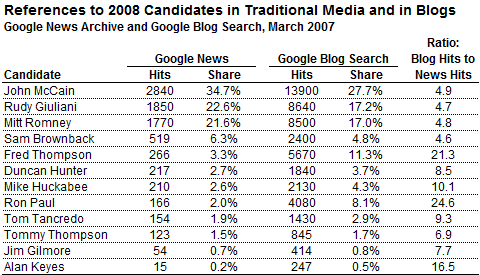 In contrast to this year’s Republican field, however, there was almost no difference in 2007 between the relative volumes of coverage in the traditional media outlets and the blogosphere: the eight Democratic candidates rank in exactly the same order in each context. One can perhaps detect a slight discrepancy for former New Mexico Gov. Bill Richardson: blogs tended to lump him into the same group as candidates like Joe Biden and Dennis Kucinich, while mainstream outlets seemed to regard him as a tier above them. But the differences are slight. Unlike the Democratic field, however, the Republican field shows some differences in the ordering for some of the more obscure candidates. Two candidates in particular, Fred Thompson and Ron Paul, were receiving far more attention in blogs than in the mainstream media. In general, the number of blog hits was modestly better aligned with the numbers of votes and delegates that each candidate eventually received in the race for the nomination. For instance, the mainstream press tended to give more attention to Sam Brownback and Duncan Hunter, who ultimately had less impact on the race than Mr. Thompson and Mr. Paul, but the blogopshere had the order about right. Still, the differences are fairly minor, and both types of outlets at this stage were notably missing out on Mike Huckabee, who would eventually receive the third-most votes among the Republican candidates. One feature of this year’s coverage, which was not so apparent in the 2008 election cycle, is that the candidates who are receiving the most attention in blogs are also those who would probably have the most difficult time in a general election against Barack Obama. Ms. Palin, who receives 30 percent of blog coverage, is among the more unpopular candidates ever to contemplate a run for the presidency, and the next four below her — Mr. Trump, Mr. Paul, Mr. Gingrich and Ms. Bachmann — also have tepid favorability ratings and would probably encounter considerable difficulty attracting independent voters in November 2012. At the same time, some candidates who are receiving a fair amount of mainstream media attention, like Mr. Barbour and Mr. Pawlenty, have yet to gain significant momentum in the blogosphere. And Mr. Romney, although he has deliberately kept a lower profile, is receiving a scant amount of attention in blogs, especially as compared to where he places in early polls. Rather than thinking of these two metrics as competing with one another, it may ultimately be more helpful to regard them as complementary. Blogosphere coverage is probably the better indicator of rank-and-file support — but many Republicans who will vote in 2012 are not yet paying attention to the race. Mainstream media coverage is a scarcer commodity, and it can be particularly valuable to candidates like Mr. Pawlenty who need to build up their name recognition. It also had a good track record in recent years: not only were Mr. Obama and Mr. McCain, the eventual nominees, ahead in press coverage in 2007 despite lagging slightly in polls, but the same was true of John Kerry in 2004. Even so, the conventional wisdom in the Beltway can also sometimes be out of touch with mainstream voter sentiments — for instance, in having regarded Mr. Brownback as a relatively serious candidate in 2008 when there was little tangible evidence that he would make an impact on the race.